These are possibly the most ridiculous things I’ve ever baked. I mean, really ridiculous. Even for me. Who has given you this. And let’s not forget these. But the people have spoken. And by people, I mean the sugar-fueled guests who come searching for me at parties where these are served, asking, “WHAT IS IN THESE BROWNIES?????”. And they’re all like, “No”. And they’re all, “Do you, um, share?”. And if you’re wondering whether these are the “naughty” or “nice” from my last post……. Pre-heat oven to 350. Butter and flour a 12 x 18 x 1 pan. Make a foil or parchment “sling” (if using foil, butter the foil as well). In a large bowl set over a pan of simmering water, melt the butter and both chocolates, stirring occasionally till completely smooth. Cool slightly. In a medium bowl, lightly whisk the eggs. Add the espresso powder, vanilla and sugar, whisking till combined. Whisk into the chocolate mixture and cool to room temperature. Add the flour, baking powder and salt – fold in till just combined. Fold in the chopped Milky Way bars and pour into your prepared pan. Smooth top with an angled spatula. Place the sliced Milky Way bars evenly on top. Bake for 30 to 35 minutes, or until a toothpick inserted in center comes out with just a few crumbs attached (do not over bake). Let cool completely, then cover tightly and chill overnight. Use a thin knife to loosen the brownies from the sides of the pan. 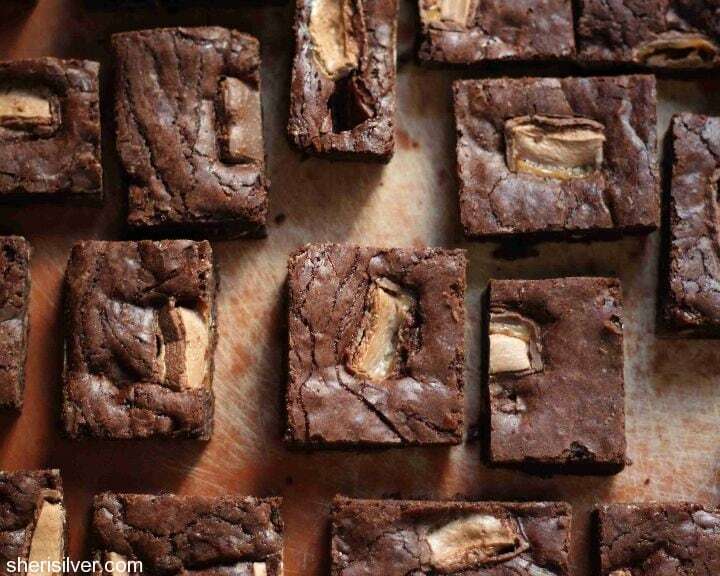 Using your sling, transfer the brownies in one piece to a cutting board. Cut into desired bars. Store chilled till about an hour before serving. Gaaaahhh!! I have been waiting very patiently for you to post this one. I’m off to the grocery store! Oh, this is too much to handle right now when I can’t have any dairy!! hummmmm coming from a person that loves to cook and hates to bake I wonder if I could bring myself to baking these? I may have to they sound delish! 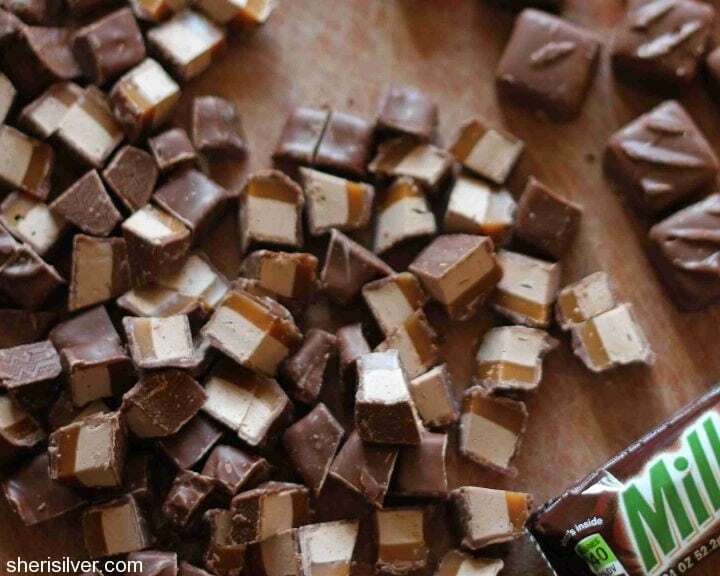 This is a good one – very easy, no mixer and, milky ways???? ?